GreenDisk offers a convenient, comprehensive set of services to help individuals and organizations reduce the expense and the environmental impact associated with obsolete technology. Specialized, convenient recycling programs are available for virtually all forms of technotrash. Each program pays particular attention to the secure, audited disposal of the intellectual property that is uniquely associated with this waste stream. With audited accountability you can be assured that your files are safe. And you can demonstrate that your materials have been disposed of in an environmentally responsible manner. Enter the desired quantity of each item and click 'Add Items To Cart'. 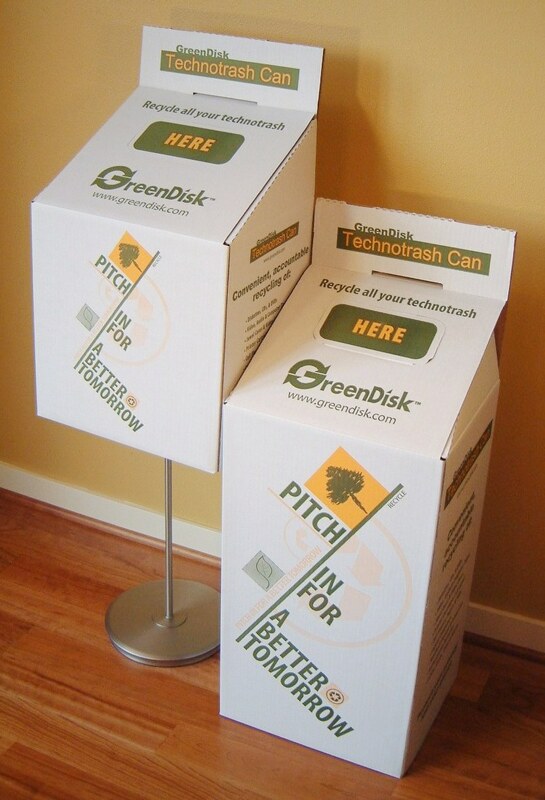 GreenDisk offers two full-service collection box options that include the box, all transportation, the destruction of content on media, and recycling of associated material – the GreenDisk Technotrash Can and the GreenDisk eMedia Recycler. Technotrash Can. Technotrash Cans are convenient collection boxes for CDs, diskettes, DVDs, ink cartridges, cell phones, videotapes, pagers, PDAs, and all of your small technotrash. Collection box, postage, processing, and Certificate of Destruction are all included for one low price. There are two sizes to choose from: Standard and Tall. The Standard allows up to 35 lbs. The Tall allows up to 70 lbs. Space permitting in both boxes. Note: 3, 10 and 20 packs are discounted and offer the best value. Discounts only apply if shipped to the same location. The TTC and EMR are only available in the 48 contiguous states. Not available in Alaska, Hawaii, Canada, Mexico or outside North America. Enterprise Recycling Compliance Report. GreenDisk also offers a compliance report detailing an organization’s technotrash returns by location by weight and number of boxes. The charge for each report is $250. This Enterprise Recycling Compliance Report is provided free of charge annually for any organization that has purchased a total of $1000 or more of technotrash services during the prior two calendar years or who is in the eMedia Recycler Program. Note: If you purchased a Pack-IT Service prior to April 21, 2016, the address of the processing facility has changed. Email (support@greendisk.com) or call with your order number and token number so we can send you a replacement label. We apologize for any inconvenience. For any Pack-IT order over 25 lbs., put the number "1" in the Pack-IT service area and the total weight less 25 lbs. in the "additional pounds" area. If you have multiple boxes, the number of labels you print should match the number of boxes. To uniquely identify your boxes, write-in (on each label) 1 of x number of boxes, 2 of x, etc. 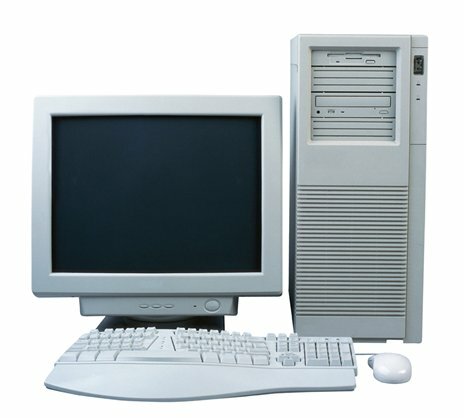 Recycling of your computer systems, individual components, faxes, printers, and other peripherals items. You can send them in as a single system or individual components. 35 lb. limit per box. See the description below the order chart. Computer System – Monitor AND CPU. Includes the processing and shipping of a complete computer system - CPU, monitor, keyboard, mouse, and cables. 35 lb. limit per box. You supply two boxes. Package the monitor in one box and the CPU, keyboard, mouse, etc. in the other. GreenDisk supplies a postage paid shipping label via email for you to place on the box. Available only in the 48 contiguous states. Not available in Alaska, Hawaii, Canada, Mexico or outside North America. To order using a PO (or check), download the GreenDisk Technotrash Recycling Order Form. Purchase order acceptance pending approval from GreenDisk. Please call 800.305.3475 with questions.